Ithaca,, NY - The Cornell University student government voted down an Israel divestment resolution. 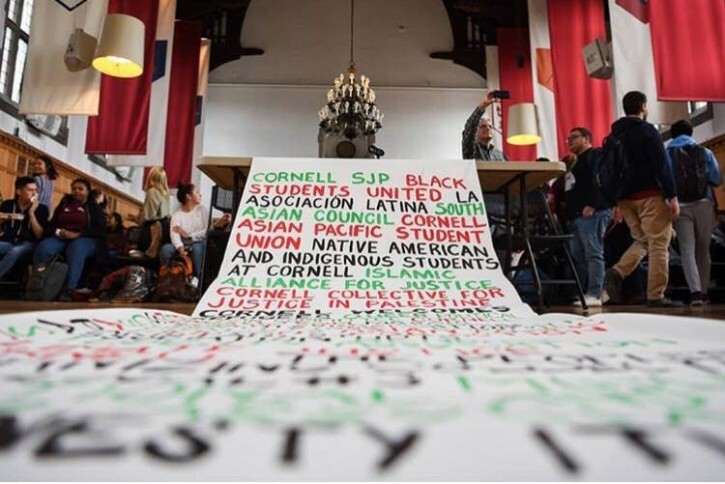 The resolution rejected by the Student Assembly on Thursday night called on the assembly to “urge” the university to divest from companies “profiting from the occupation of Palestine and human rights violations,” according to the campus student newspaper the Cornell Sun. The vote was 14 in favor, 15 against, and 1 abstention. Two of the votes against the resolution are called “community votes” and were allocated by the 582 students who came to the meeting and voted on the issue. The community votes were 248 in favor, 330 against and 4 abstentions. The votes are all or nothing. Cornell Student for Justice in Palestine, which brought the resolution to the student government, claimed victory in a post on Facebook, noting that when a similar resolution came before the Student Assembly five years ago it was shot down immediately. This resolution generated weeks’ worth of discussion and was only defeated “by a quirk of parliamentary procedure,” the post said referring to the community votes. “Over the next few weeks, you may encounter fellow students who are frustrated or angry about the outcome of the resolution or others who may have questions. We encourage you to respect the diversity of viewpoints on campus and to present your own feelings and opinions in a respectful manner at all times,” the post said. How about this, anyone who supports-not supporting Israel-give up everything you have that has been invented or produced in Israel. Anyone has a right to be against anything they want, but then, your don't have a right to benefit from what the country has developed or produced. Give up your cell phones. Give up surgical procedures and instruments. Give up the fruits and vegetables. This is just to name a few. If a person sincerely believes in not supporting Israel give up all the above-see how your life goes then.